Verizon, in just New York State, may have added the equivalent of 41 to 65 million wired access lines to handle Verizon Wireless's cell site buildout and traffic, from just 2010 to 2012. And yet, Verizon has been claiming over and over that the company has been losing access lines. In fact, the US Telephone Association, (quoting Verizon), stated that "In 2000, (Verizon NY) had over 11 million access lines. Today they have 2.9 million access lines." Here's a snapshot of what triggered our new investigation. 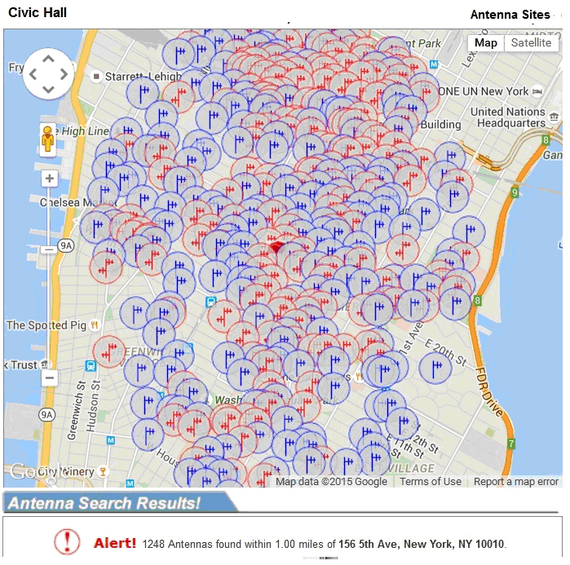 I go to AntennaSearch.com and type in the address for Civic Hall, (a tech meeting and work space in Manhattan, New York, on 5th Ave) and this map appears showing 1,248 wireless 'antennas' within one mile of the location -- Whoa. There are also an additional 122 wireless towers in the one mile coverage area. This is the definition of a "Tower" and "Antenna". "Towers: Registered and Non-Registered structures where antennas are placed. 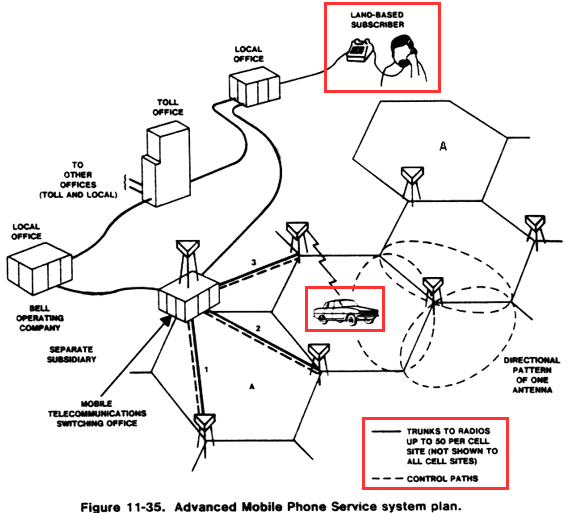 Towers may be used for various services including Cellular, Paging, Microwave and others." "Antennas: The actual emitters of radio signals. Antennas can be placed on towers (multiple) or can be installed stand alone on top of existing buildings. Stand alone antennas are small (well below 200 ft). You may also check multiple antennas to determine which cell phone carriers are located on a particular tower." 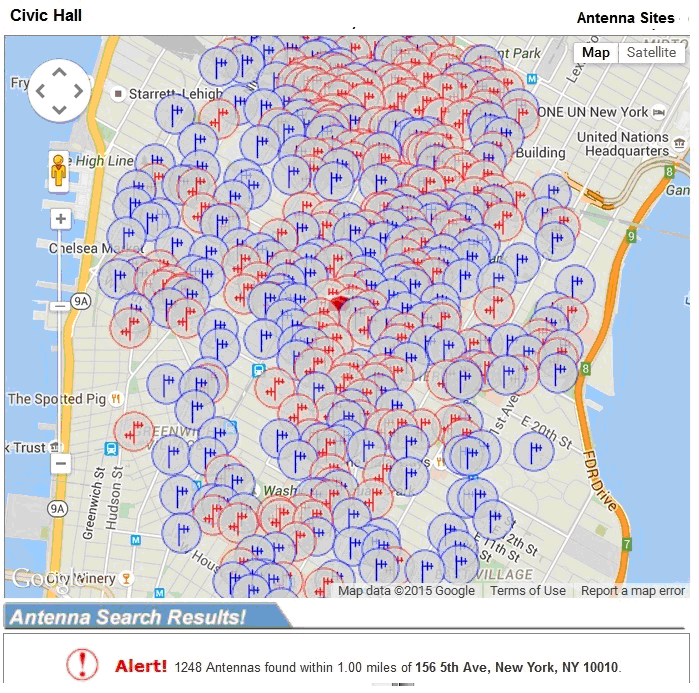 However, when I discussed the data with wireless experts, they explained that this is only a fraction of the antennas and cell sites in this area of New York City or in the State, and the information mostly covers the smaller wireless carriers; Verizon Wireless's cell sites and antennas are not included, for example. I'll come back to the Verizon Wireless information in a moment. Almost all of these wireless sites have a wire connected to them, and there can be a few access lines to thousands of access lines (or "virtual" lines, which I will explain), to handle the wireless traffic. Sooner or later, wireless calls and data end up traveling over a wire. These are commonly called "Special Access" or "backhaul" lines and they are NOT included in the access line accounting that Verizon et al. keeps repeating, and which is parroted by the USTA, as well as the NY State Public Service Commission, (NYPSC), among others. And no one -- not Verizon, or the NYPSC, or the FCC has any complete, public data or documentation about the number of lines or even wireless cell sites. And why would Verizon not want to include these lines? Doesn't it want to show major growth? In a previous article I detailed how Verizon Wireless has taken over the wired agenda, which includes shutting off the copper wires in some areas by claiming that the networks are 'unprofitable'. But we also called into question the accounting of the access lines, which left out all other services besides "POTS", the copper-based, plain old telephone service. Verizon's plan has been to show line losses to get rate increases, and to use it as part of their public policy efforts, both state and federal, to get rid of regulation and not have obligations like having to offer wired services at all. Thus, hiding tens of millions of lines from the accounting of access lines has multiple benefits. Follow the Wireless Call -- See the Wire. 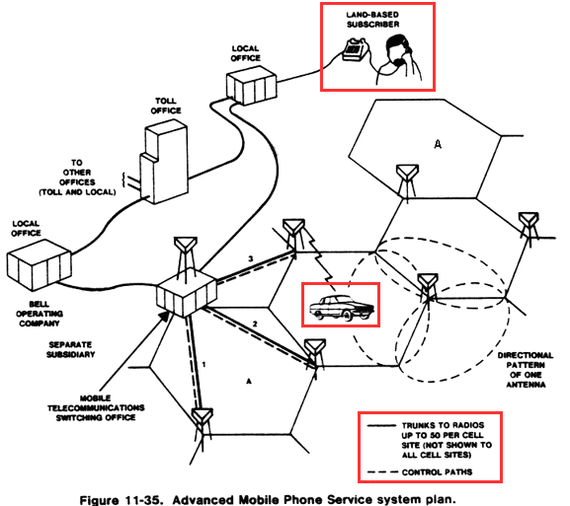 Also, notice that there is a little box that says that a cell site can have 50 'trunks', which, for this discussion, can be 50 access lines. And each cell site can have multiple cell providers -- and more lines. For decades upon decades, a phone line was dedicated to one caller at one time. But that changed with added technologies and something called a "multiplexer'. You probably know about or have been in a 'multiplex theater', which started usually with one building that had one movie theater and then the building was converted to provide lots of 'screens' in separate, smaller theaters playing different movies simultaneously. In this instance, it's close to the same thing, where one access line (one wire) using a 'multiplexer' (and other technology) can have multiple, different, simultaneous connections (callers), all doing lots of things, from voice calling to texting or sending videos. One example: There is a copper-based service called a "T1", which is a business service that historically has been the equivalent of 24 lines and this was a standard for cell sites for the previous decade. -- I.e., essentially it is one copper wire that can handle 24 access line 'channels' at the same time -- 24 different users, simultaneously. (The wire is actually two copper wires intertwined, usually referred to as a 'twisted pair'.). The bottom line is that one T1 line with technology could replace what were originally 24 separate wires. In the accounting of access lines, these 24 separate lines would have been 'lost' once the T1 service was added. There are also a host of other business services where the actual wires can handle hundreds or thousands of 'channels' that are the equivalent to thousands of "virtual" phone lines; these services can be based on copper or fiber optics. Cell towers need to have lots of lines/channels in play at the same time. Think of it this way. You are sitting in Yankee Stadium, and the place is packed to capacity with 49,642 baseball fans. How many simultaneous calls can the company handle, especially when people can stay on the phone for extended periods? With most people having a cell phone and the odds of 30%-50% of the fans having a Verizon wireless phone -- about 15,000-25,000 customers could conceivably want to send or talk during the game (and the number doesn't include staff, the players, etc.). This doesn't always go well. According to CNN, in 2012, app maker SwayMarkets tracked the cell phone usage during a game at Fenway Park in Boston and found that when the baseball action stopped or slowed, "Verizon and Sprint's networks virtually crashed, with speeds sometimes falling below 100 kilobits per second... As play resumed, network quality quickly bounced back from 'dreadful' to 'poor'." Thus, Verizon has to account for the number of actual special access lines that can handle the connections that may be made, as well as the capacity of the network to deliver on what is expected, broadband. And think about entire cities, states, or even the coverage requirements due to the increases in mobile broadband and Internet use. Also, having to make sure that a customer can use the service requires tens of millions of extra lines and connections; it isn't simply about the population of the state. For example, New York City has a population of 8.5 million, but had 53 million visitors in 2013, while Grand Central Station, alone, has "750,000 people pass through Grand Central daily and over 1,000,000 people during the holidays." -- Now plan for rush hour peaks and cell phone use. I note that Times Square, just a few blocks away, had 130 million people come through in just one year. 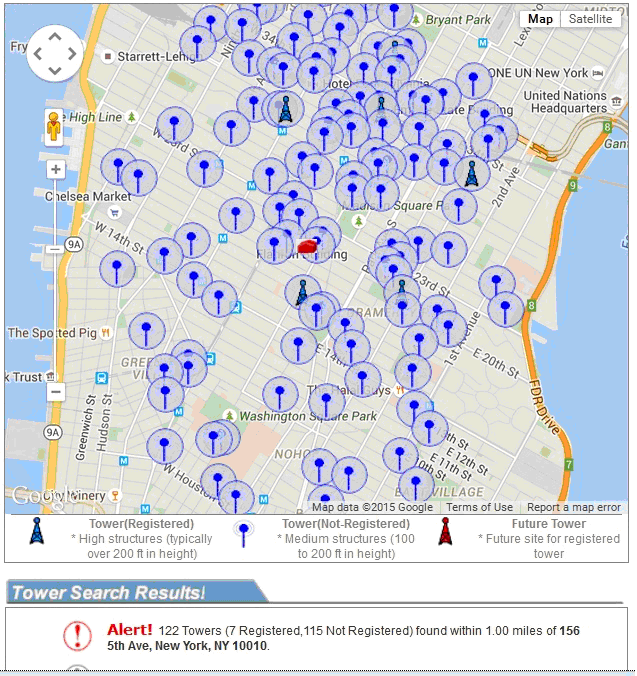 AntennaSearch detailed that Times Square had 2,610 antennas listed and 178 towers within a one mile area. 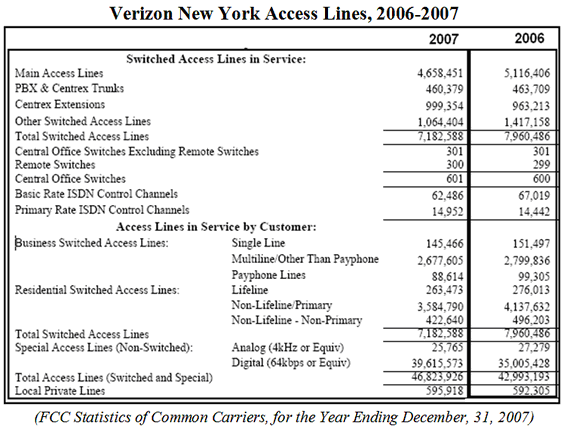 Verizon New York's press releases detailed the number of cell sites installed by the wireline side of the business, starting in 2010. "Verizon Invested More than $1.5 Billion in New York's Wireline Communications, IT Infrastructure in 2011." The text states, however, that the fiber optic cell towers for wireless services are a fiber optic, wired product. "Accelerated deployment of fiber-optic links to wireless carriers' cell sites throughout New York as these carriers expand their infrastructure to meet ever-growing demand for wireless broadband and advanced 4G services. In 2011, Verizon deployed fiber optics to connect 1,848 of these sites in the state." 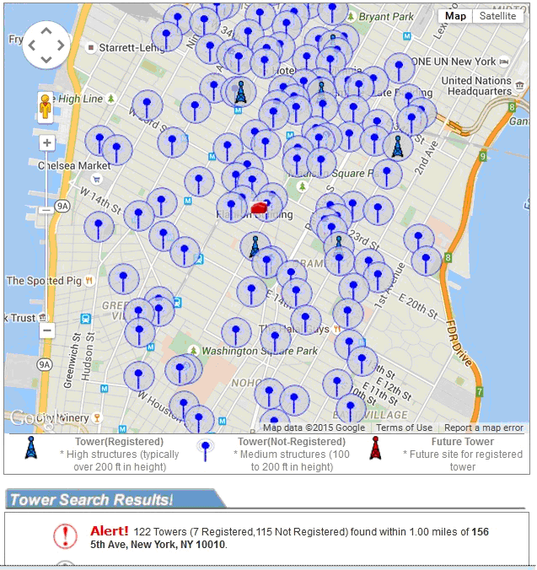 In 2010, Verizon added 2,800 cell sites just in New York State, which, we estimate had access line capacity to handle between 14 to 22.6 million connections. By the end of 2012, we estimate that there could be as many as 41 to 65 million lines/channels, just for the years 2010-2012. These estimates were created based on interviews with Verizon staff on what technology has been installed in most cell sites. For example, by 2012, Verizon had been using a technology that has a capacity for 32,000+ virtual access lines which runs over fiber optic wires, and can be configured to a host of services from voice calling or broadband. NOTE: This does not take into account the other 146,000 towers and antennas in New York State. 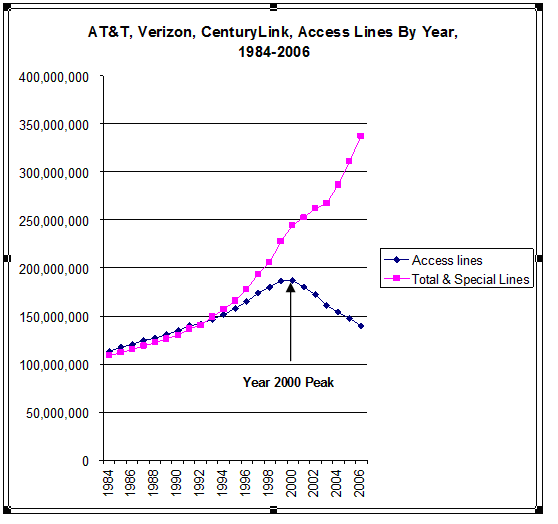 Our calculations are based on how FCC has historically examined special access lines. Infuriately, the last data supplied by the FCC was in 2007. Click to read more about special access lines. 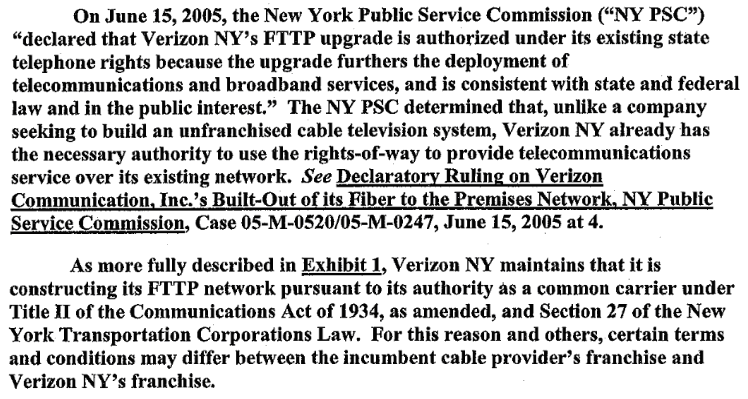 And this next detail is from the last FCC report which supplies the access lines for Verizon New York at the end of 2007 and for 2006. There were 47 million total access lines listed. While Verizon probably quotes the 'main access lines', which did go down, there is a 40+ million line difference between these two statistics. And this was in 2007 before the 'special access' explosion of lines for cell sites. We don't have all of the answers, and we have our own doubts about the FCC's methodology, but what we found exposes a fundamental truth -- Verizon and the other phone companies appear to have succeeded in convincing people to only look at one class of lines, POTS, and not the tens of millions of lines that are in service and are classified as part of the state utility networks. How can Verizon keep telling us they are losing lines? Shouldn't the FCC, State and City demand to know exactly how many access lines are in service today or at least how many virtual lines there are? Finally, there are those who doubt that these copper or fiber lines are part of the NY State utility networks. 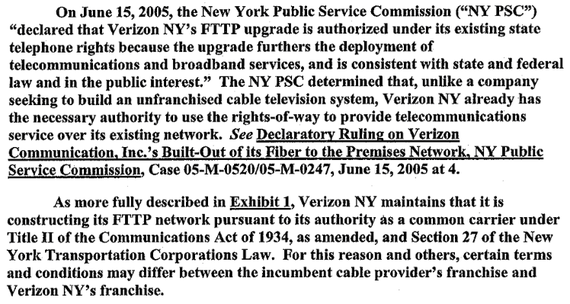 This next excerpt is a quote from 2005 where Verizon asked the NYPSC to classify the fiber optic wires that are used for FiOS, (Verizon's group of services that includes cable TV, phone, Internet and broadband) as part of the state utility, and the State agreed. Moreover, there are those who claim that classifying the networks as "Title II" harms investment. As we documented, using this decision to make the fiber optic lines part of the state utility also means that these networks are classified as Title II, common carriage and telecommunications. This regulatory shell game allowed the company to dump the fiber optic construction expenses into local service which also ended up as the reason for extra charges via rate increases on basic phone service -- thus making customers defacto investors and Title II being the vehicle for this 'investment'.